Experts from industry and academia have unveiled ambitious new proposals as part of a major review for how Government, academia and industry can work together to grow the UK’s burgeoning Artificial Intelligence (AI) industry and increase use of AI right across the economy. The eagerly-anticipated report, Growing the Artificial Intelligence Industry in the UK (published on 15 October 2017) analyses the UK’s current capability in this area and sets out bold proposals for how the UK can stay ahead of the competition and ensure the adoption of cutting-edge AI brings with it substantial benefits for people and businesses across the country. Research: building on the UK’s strong record in cutting-edge AI research, with targeted proposals including making the Alan Turing Institute a national institute for AI. The report’s recommendations for how Government, academia and industry can work together will now be carefully considered in discussions towards an Industrial Strategy sector deal between Government and the AI industry. Artificial Intelligence is a long-established discipline at the University of Southampton with world-class researchers working in various elements of AI, including intelligent agents, machine learning, game theory, evolutionary algorithms, complexity science, biometrics and machine vision. 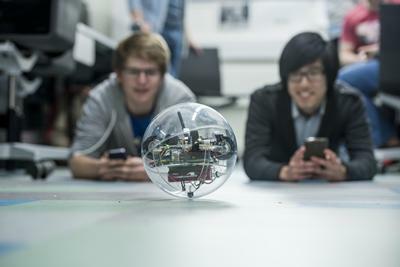 Academics are also inspiring the next generation of experts through our highly successful MSc in Artificial Intelligence and undergraduate MEng degrees in Computer Science with Artificial Intelligence and Electronic Engineering with Artificial Intelligence. Cars: Driverless cars are set to make the roads safer for pedestrians and car drivers alike, with companies like Oxbotica developing fully autonomous operating systems that diagnose vehicle issues and identify the best, most logical route on the move. The report forms a major part of the Government’s Digital Strategy and Industrial Strategy, and will help inform discussions between Government, industry and AI experts as they explore a sector deal package, to help the UK AI industry fulfil its potential. As part of the Industrial Strategy, the Government has increased investment in research and development over the next 4 years by £4.7 billion to create jobs and raise living standards through the Industrial Strategy Challenge Fund. “Artificial intelligence presents us with a unique opportunity to build on this track record of research excellence by leading the development and deployment of this transformational technology. It is an opportunity we simply cannot afford to miss. “Growing the Artificial Intelligence Industry is a report that exemplifies the world-class expertise the UK already has in this area, demonstrates the huge social and economic benefits its use can bring, and represents the industry’s vision for how we can lead, rather than follow the world in this field. “I want the UK to lead the way in Artificial Intelligence. We have a great history, and in Alan Turing, a unique founding figure. We also have some of the best minds in the world, working in some of the world’s best universities here in the UK. “Artificial Intelligence could improve our lives in many ways, from almost every aspect of healthcare, streamlined personal public services, better use of scarce resources, and chatbots, to robots that take over dirty dull and dangerous tasks so that people don’t have to do them. AI could create new industries and services we cannot yet imagine.